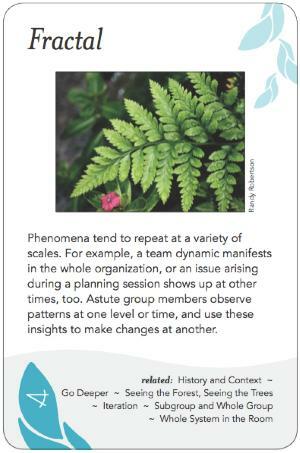 Phenomena tend to repeat at a variety of scales. For example, a team dynamic manifests in the whole organization, or an issue arising during a planning session shows up at other times, too. Astute group members observe patterns at one level or time, and use these insights to make changes at another. At its most basic level, Fractal can simply be noticing one's internal response and from that surmising that others may be having a similar response. For example, if a participant in a meeting makes a statement that i feel confused by, i assume that others may be confused too, so i ask the speaker to explain what they meant. In another example, if i am feeling sleepy and fuzzy-headed, that might indicate that the group is tired and needs a break. Of course this is weighed against other data--if it's first thing in the morning, my sleepiness may be because i stayed up late the night before, whereas if it's mid-afternoon, it's more likely that others are feeling the same way and that group action is warranted in response. Obviously not everything that a facilitator thinks and feels is an expression of the group. It's good for a facilitator to have some personal practice that helps them grow in self-awareness, such as co-counseling, meditation, focusing, etc., so that they become more able to discern when they are experiencing something of the group's vs. when it's only their own stuff. In order to serve as a Letting Go, the facilitator needs to develop both by increasing internal awareness and by receiving feedback from others. Even after much practice, one can never be sure of the validity of this type of hologram, so it's important to offer insights and suggestions arising from it with humility and a hint of tentativeness, rather than assertively or with a sense that one has "the truth." Trust the Wisdom of the Group. Another example of how Fractal manifests is in a particular type of Founders' Syndrome, where an organization replicates the gifts and flaws of its founder, writ large. For example, if the leader of a nonprofit has trouble being realistic about money, the whole organization might suffer from a similar denial and avoid the timely collection of financial information for reporting cash flows and balance sheet. Because all the levels are connected, in this type of Fractal part of the practitioner's work in preparing for a group dialogue is to figure out what to emphasize when talking ahead with the leader (who has some power to shift the organization) and what kind of advance work to do elsewhere in the organization (which may change, rein in, or replace the leader). At a mid-level of scale, a team or department may replicate dynamics of the larger organization it is embedded within, positive or negative. While it can be hard to make changes in a team hemmed in by organizational expectations, if the smaller group is able to come up with a better way of doing things, their innovation has the possibility of spreading throughout the organization--this is sometimes called "the tail wagging the dog." At a larger level, many social dynamics that can be observed within a group can also be observed between groups, or in society at large. Taking a negative example, scapegoating may happen at scales ranging from a household blaming its troubles on one member to a society blaming its troubles on one ethnic group. In a more positive set of examples, at small scale one person may apologize to another for a wrong done in order to restore a more satisfying relationship, while at a larger scale the nation of Australia in 2008 apologized to its Aboriginal peoples for generations of oppression. Discernment: Decide whether what's happening has hologram aspects to it. Deliberation: Figure out what can usefully be done with that knowledge (such as where to intervene in the system) and make a decision on how to act. Receive feedback, which leads into further awareness. Hologram is another term often used to talk about this phenomenon. Another earlier name for this pattern was "As Above, So Below." Tree writes in Sept. 2014: This summer i worked with a group that had recently lost its organizational home, which had from the beginning provided the smaller group with both institutional backing and a physical meeting location. When i showed up to facilitate the all-day retreat, the person hosting us at their home was unavailable the first 20 minutes, their spouse was clearly unhappy at our presence, and a few of us wandered from room to room trying to figure out which space to set up the meeting in that would serve best and be lowest impact. When the host finally emerged from the shower, i had to withdraw while they and their spouse argued over where to put us. While terribly frustrating in the moment, i realized afterward (thanks to an insightful comment from one of the participants) that it was a great demonstration of the Fractal pattern. For examples of "the tail wagging the dog," see Positive Deviance.